Save 20% when you buy direct from us. Use code tpdirect at checkout for 20% discount. Policing is at a crossroads. At a time of unprecedented cuts and increasing levels of demand, the British police service (like many others around the world) faces huge challenges. Under the most radical reforms the police service has ever experienced, its leadership is looking for new approaches that can maintain levels of service delivery and secure efficiency, accountability and public confidence. But recent history shows that applying private sector business models to the public sector often generates hidden costs and unintended consequences that damage productivity and morale. The health service, social services and local government across the board have been profoundly damaged by a culture of targets centralisation, back office expansion, economies of scale and so on. In spite of this experience, in the UK and elsewhere, reform programmes and prevailing management practices still seek to enforce approaches that have demonstrably failed. In Intelligent Policing, Simon Guilfoyle proposes a simple and elegant solution that refocuses organisational activity on the service user (the general public). 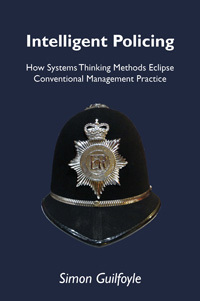 Drawing on his own extensive experience as a police officer, he uses a range of evidence to explore the possibilities that systems thinking offers. Using detailed examples, he shows how a systems-based approach can bring greater efficiency, improved service delivery, enhanced morale and reduced cost. The practices and models proposed in the book can all be implemented immediately and the author points out that senior police leaders and policy makers now have the perfect opportunity to make lasting improvements today that will resonate throughout policing and leave a positive legacy for the future. Intelligent Policing is a rich resource for anyone who cares about delivering an effective policing service. It will also interest systems theorists for its practical approach to policing and inform academic debate in the fields of management and human behaviour.